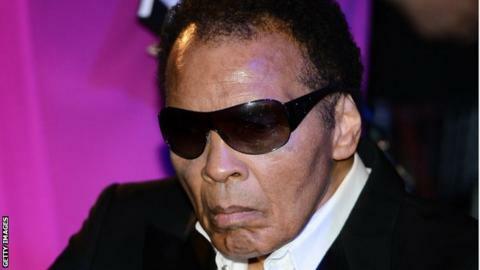 Muhammad Ali's doctor says the iconic boxer had been "having a tough time in the last year" before his death. The three-time world heavyweight champion, who had Parkinson's disease for 32 years, died aged 74 from "septic shock due to unspecified natural causes" according to his family. "The last week has been particularly tough," said Abraham Lieberman, who was with Ali only hours before he died. "It became apparent God wanted him and we all became reconciled to it." Lieberman said Ali had been supported by his family throughout his illness. "His Parkinson's got worse, but he had a very devoted family who really treasured him and gave him as much quality of life as you could have," he said. Lieberman, a director of the Muhammad Ali Parkinson Center in Arizona, rejected suggestions that boxing was solely responsible for Ali's illness. "I can't tell you boxing didn't have a role, but I think he had regular Parkinson's disease," he said. "People that develop Dementia Pugilistica are usually dead within three or four years. He's had Parkinson's for over 30 years." Lieberman told BBC Radio 5 live's Sportsweek that Ali was "not an ordinary person" and "stood up" for he thought was right. "He treated everybody - from the humblest person to the biggest celebrity - the same," he said. "You could not believe how nice he was outside the ring compared to the way he was inside the ring." Lieberman recalled a story from many years ago, when an elderly man in a nursing home mistook Ali for another great boxer, Joe Louis. "Muhammad said: 'If it gave that old man pleasure to think he met Joe Louis, then I'm Louis. '," said Lieberman. "I think that summed up Muhammad. He was a great personality but really a kind person, with tremendous feeling of sympathy for people." Former boxer Joe Bugner fought Ali twice and described him as "unique". He added that he was not just "a great, great boxer" but also a very intelligent person. "Nobody could outwit him as far as the words were concerned," said Bugner.